For an easy 7 Swag Bucks, just watch the Telestrations Video and answer the poll question that follows. Couldn’t be simpler! 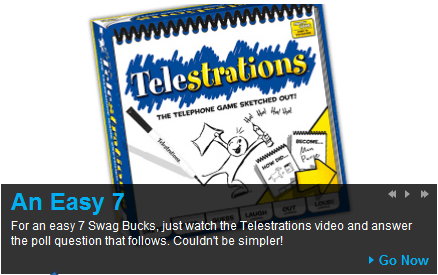 Just head on over to the Swag Bucks Toolbar and look for the Telestrations Video Tab. If you haven’t joined Swag Bucks yet, what are you waiting for. Join Swag Bucks Today. Swag Bucks pays you to use their search engine.